All You Magazine Giveaway & Special Deal for Frugal Living NW Readers Only! Many of you have noticed that many high value coupons come from the magazine All You. It’s only available at Walmart and by subscription. You can see this month’s coupons here. If you were to subscribe through the All You website, you would pay almost $24 dollars for the first year. But that’s way too expensive! I have teamed up with local Southern Living at Home consultant Tanya Hinshaw to offer a fantastic price of $19.99 for TWO YEARS. Here’s where it gets even better. 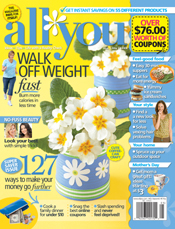 We are giving away one two-year subscription to All You magazine this Thursday evening. To enter this giveaway, just leave a comment with your name & email address before Thursday, May 7 at 6:00 pm Pacific. I would love to win this! I just started couponing a few months ago and have saved so much already! Thanks for the chance on the drawing! I’m new to couponing/bargaining- I’m loving it, but kicking myself that I didn’t start doing this earlier! Thanks for all the great stuff you have been teaching Abby! positively pumped about possibly being picked! me, me, me… pick me!!! it would sure be a blessing!!!! Love your site, I’m becoming addicted!! And learning how to look for my own deals 🙂 Thanks for chance to get this great magazine! I am so glad that you are doing this! Camille, smatshopper04@yhoo.com! Ooooh! I would LOVE it! Ohh I would love it! Can’t wait to find out who wins! Thanks so much! I can’t wait! Thanks for posting your great savings! I check your site before I head out to do my coupon shopping. Would love to have more coupons, that’s for sure! Your blog inspires me. I love saving money so I can do other things with my family. Thank you for all of time and effort that you spend – you are helping so many families!!!! Thanks so much. My subscription ends this month!